The 50th and most recent state to join the United States of America (on August 21, 1959), Hawaii is one of the most desirous states in terms of travel of tourism, and an absolutely beautiful place for camping and outdoor adventure. Hawaii is an isolated volcanic archipelago in the Central Pacific Ocean, and its many islands are famous for their rugged landscapes of cliffs, waterfalls, tropical foliage and breathtaking beaches, where visitors will find sands of white, gold, red, black and even green. Of the six main islands that make up Hawaii, Oahu has the largest city and the state’s capital—Honolulu—home to the renowned Waikiki Beach and the World War II memorials at Pearl Harbor. Hawaii is the 8th-smallest state and the 11th-least populous state in America, but it is also one of the most densely-populated states, ranking 13th in that category. It is the only state in America that has an Asian plurality. The coastline of Hawaii stretches some 750 miles long, making it the fourth-largest coastline in the U.S., after the coastlines of Alaska, Florida and California. Hawaii’s dense and very unique natural scenery, warm and pleasant tropical climate, plurality of public beaches, ocean-based surroundings and active volcanoes make it a very popular place for a vast collection of outdoor enthusiasts, including campers, surfers, hikers, biologists and volcano specialists. Due to its central location in the Pacific and the impactful 19th century labor migration, the state’s culture is strongly influenced by both North American and Asian American cultures, making it a great place in which to meet people from around the world. In the following article we will highlight five of Hawaii’s most popular and well-visited campgrounds—beachfront and wilderness campgrounds—and describe the many amenities, features and activities that have made each of these destinations so heavily-trafficked and ultra-popular. Located on the Farrington Highway, in Waialua, Hawaii, Camp Mokuleia offers the very best in beachside camping and all the amenities that regularly draw weekend and summertime visitors to the camp’s gates. With accommodations that range from private lodge rooms to shared cabins to primitive campsites, the camp offers a wide array of options for campers—campers who can spend their time fishing, snorkeling, or participating in other water and land-based activities and diversions. Camp Mokuleia is a welcoming beachfront oasis and an historic camp for youth and adults, one that is situated on Oahu’s famed North Shore, a mere 40 minutes from downtown Honolulu—Hawaii’s capital and a major economic center. The camp’s secluded location and extremely attentive staff will ensure you and your group find the rest, relaxation, and renewal you are seeking, all in the spirit of “aloha” and the welcoming Hawaiian atmosphere. Meaning “a place of abundance” in the ancient Hawaiian language, Mokuleia definitely lives up to its name, providing guests with a Hawaiian-styled place where their spirits, sense of adventure and their bellies are satisfied in abundance. The oceanfront location of Camp Mokuleia makes it ideal for a wide range of activities, including swimming, snorkeling, kayaking, surfing, or simply relaxing amid the soothing sounds of waves lapping on the shore. Nearby there are a number of wonderful trails that are perfect for both hiking and biking—trails that travel through a national area reserve. There are even opportunities for skydiving, gliding and horseback riding. All of the accommodations at Camp Mokuleia are expertly maintained by the facility’s wonderful staff, people who are always on hand to answer questions about the camp’s history and offer advice with regard to the many activities offered here. Cabins and tent cabins must be reserved before arriving at Camp Mokuleia, while the tent camping sites, of which there are dozens, are typically available on a first-come, first-served basis. Located on the Big Island, Hawaii Volcanoes National Park is a unique destination where visitors and campers can get up close and personal to live lava flows, lava tribes and glowing craters that will amaze both the young and old in your family group. There are two distant, drive-in campgrounds in Hawaii Volcanoes National Park: Namakanipaio and Kulanaokuaiki. The Namakanipaio Campground is operated by the Hawaii Volcanoes Lodge Company and is located just over 31 miles south of Hilo on Highway 11. The campground, which is situated some 4000 feet above sea level, boasts a large open grassy expanse flanked by tall eucalyptus and ohi’a trees. The Namakanipaio Campground has a number of amenities for the convenience of campers, such as restrooms with flush toilets and showers, running water, picnic tables, picnic shelters, BBQ grills and fire pits. Campers should know there is a pay station on site, and the first-come, first-served campsites will cost them $15 a night. Park entrance fees also apply in addition to the camping fee. Daytime temperatures at the Namakanipaio Campground range from the low 60s to the high 70s, while the nighttime temperatures can get as low as 30-40 degrees. The Kulanaokuaiki Campground is located about 5 miles down the Hilina Pali Road at approximately 2700 feet of elevation. The 9 designated campsites at Kulanaokuaiki have picnic tables and tent pads, and are also available on a first-come, first-served basis. There is no running water here, but vault toilets are provided for those who venture into this fairly primitive camping area. Fees at the Kulanaokuaiki Campground are $10 per night ($5 for seniors) and the maximum stay is seven consecutive nights. Both the Kulanaokuaiki and the Namakanipaio Campgrounds offer peace, seclusion and the ultimate in privacy, and both are very near some of the state’s most active and beautiful volcanoes—attractions that make the “roughing it” atmosphere at these two campgrounds well worth the visit. If you’re looking for an experience unlike any you will find in Hawaii, you should definitely head to the Polipoli Spring State Recreation Area, situated on the beautiful island of Maui. Located at 6,200 feet above sea level, this gorgeous state park is one of the highest of its kind in the state and certainly one of the most beautiful. The forests at the Polipoli Spring State Recreation Area tend to remind seasoned campers of America’s Pacific Northwest, rather than tropical Hawaii, as the overnight temperatures can dip towards freezing. However, the days are typically glorious and ideal for a wide range of activities. Hiking in this beautiful forest is by far the most popular activity. Several rugged, yet well-groomed trails, all of which originate at or very near the primary camping area, take campers through a maze of glorious foliage and majestic vistas; trails that range from easy, one-mile hikes to extended backpacking excursions complete with overnight camping outposts for those who dare to traverse it. The campground at Polipoli Spring State Recreation Area is loaded with great amenities. They include several bathrooms with flush toilets, running water and hot showers; picnic tables and overhead shelters; BBQ grills; fire rings for campfires; trash bins and more. The campsites have tent pads to ensure an even, level surface, and the spacing between sites ensures a superior level of privacy and seclusion. The overnight camping fees at Polipoli Spring State Recreation Area range from $15 to $30 depending on location, with a slight discount for senior citizens. The sites are available on a first-come, first-served basis, so be sure to arrive early and secure your spot at one of Hawaii’s true gems. With seemingly endless summer-like weather comes an endless number of opportunities for summer activities, all of which can be enjoyed at Bellows Field Beach Park in beautiful Oahu, Hawaii. Here campers can enjoy diversions such as swimming, surfing, boating and hiking, at a beachfront locale in one of the most breathtaking places on earth. During the week, the beach upon which the campground is located serves as a military training area, but on the weekends (and many summer days) fifty great campsites open up for residents and visitors to enjoy. Campers can relax under the warm Hawaii sun or splash in the surf by day, and spend their evenings listening to the waves as they crash against the shore. Just the smell of the salty air at Bellows Field Beach Park is enough to bring a smile to campers’ faces, but the campground’s amenities and the great activities offered here are sure to widen those smiles. Bellows Field Beach Park has a wealth of amenities, including a trained lifeguard patrolling the swimming area; snack stands selling tasty local treats and traditional favorites; BBQ grills and fire rings; restrooms with running water, showers and flush toilets; a souvenir store; playground for the kids; and dozens of picnic tables, including several with coveted overhead shelters. Water sports and activities, including swimming, snorkeling, paddle boarding, surfing, boating, and water skiing, are very popular at Bellows Field Beach Park, but hiking and backpacking are also enjoyed by campers. The park offers a number of great trails that take participants high above the beach and upon the area’s cliffs, giving campers a bird’s eye view of Oahu and beyond. The 50 campsites are available on a first-come, first-served basis. These sites tend to fill up quickly during the summer time, so be sure to plan ahead to guarantee this once-in-a-lifetime adventure in this island paradise. For campers and backpackers who don’t mind a bit of a hike before they set up camp for the night, Na Pali State Park offers an ideal and pristine setting. The adventure of camping in this beautiful Kauai national park begins with getting to the final destination, and to get there you must take the breathtaking 11-mile Kalalau Trail, which eventually dead ends at a perfect little spot for camping. If you are unable to walk the entire trail in a single day, there is also a great spot about six miles in, where campers possessing the valid permits can pitch their tents for an overnight stay of resting and recharging. Perhaps the best part of Na Pali State Park is the amazing scenery—a truly special place for birdwatchers, hikers, backpackers, nature lovers and for those who just want to take in the view. The “palis,” or cliffs, provide a rugged backdrop of deep, narrow valleys ending abruptly at the ocean shores. Waterfalls and rapid flowing streams continue to cut these massive valleys through the years while the sea carves the cliffs at their mouths. Seemingly never-ending stone-walled terraces can still be found on the valley bottoms, where Hawaiians once lived and cultivated taro. Permits for camping along the aforementioned Kalalau Trail are issued for that trail only and the preferred destination at the culmination of the 11-mile trek. Hikers and campers are urged to watch out for the following potential hazards: falling rocks from the cliffs overhead, flash floods during periods of heavy rain, and hazardous cliffs that may include some rocky and unstable footing. The fees to camp at Na Pali State Park are $15 per night for the residents of Hawaii and $20 per night/per-person for non-residents of the state. The maximum length of stay is five consecutive nights, and camping is permitted throughout the year, except during periods of inclement weather and potential flooding when the trail becomes closed for grooming and repair. 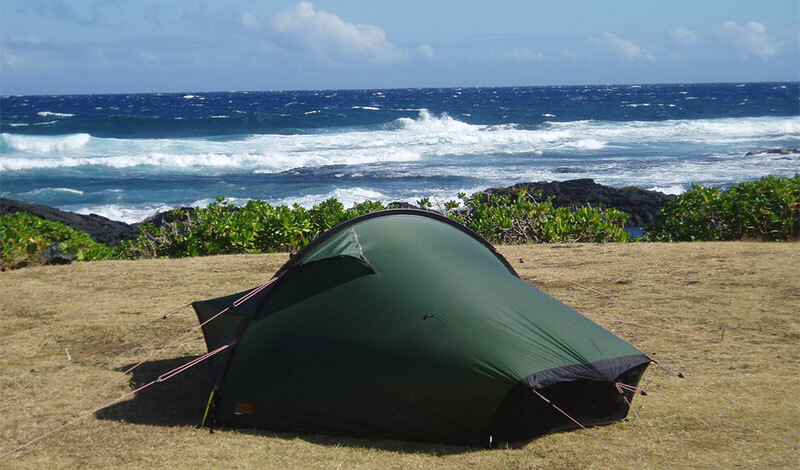 All campsites at the end of the Kalalau Trail are available on a first-come, first-served basis.